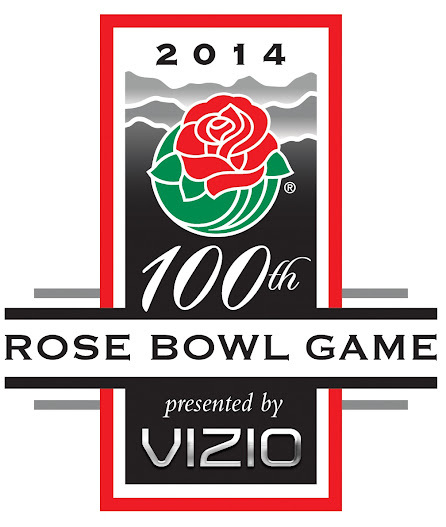 PASADENA, Calif. – The Tournament of Roses along with its partners, the Big Ten and Pac-12 Conferences, and the Bowl Championship Series unveiled a series of new programs including a new logo and modifications to the champion’s trophy to commemorate the 100th Rose Bowl Game presented by VIZIO. The Tournament revealed a commemorative 100th Rose Bowl Game logo to be used in conjunction with celebrations leading up to the historic event. The logo incorporates important aspects of traditions associated with the game including a Pasadena architecture-inspired design concept, homage to the San Gabriel Mountains and complimentary primary colors that highlight the Tournament of Roses and title sponsor, VIZIO. In addition, the Rose Bowl Game trophy, specially commissioned by Tiffany & Co. for the 100th Rose Bowl Game, underwent modifications including adding 24k yellow gold vermeil accents to the approximately twenty-one inches tall trophy. The design features a 3/4 size football rendered entirely in sterling silver. Taking approximately three months to complete, master artisans employed age-old techniques – spinning, silversmithing, chasing, etching, and polishing – to create the trophy. The release of the 100th Rose Bowl Game Commemorative Book in partnership with Whitman Publishing House and the Vault Series. Authored by Malcolm Moran, this is the first book commissioned by the Tournament of Roses on the history of the game. A Rose Bowl Game social media campaign 100 days out leading up to New Year’s Day which will include opportunities for fans to interact with the game on various social media platforms. In conjunction with the Football Writers Association of America, the Rose Bowl Game will announce an All-Century Class on December 8, with representatives from each decade. Lastly, in the upcoming months, Rose Bowl Game fans will learn about an opportunity to make a permanent mark at the Rose Bowl Stadium that will go toward the Legacy Campaign to ensure the stability and success of America’s Stadium. The present exclusive agreement among the Tournament of Roses Association, the Big Ten Conference and the Pac-12 Conference was born in 1946. The pact is the oldest intercollegiate postseason bowl agreement between two major conferences in the United States, hence the Rose Bowl Game earning the nickname, The Granddaddy of Them All. Five days after this postseason milestone, the Tournament of Roses will also host the 16th and final BCS National Championship on Monday, January 6, at the Rose Bowl Stadium. This will mark the second time the Tournament of Roses has hosted two postseason bowl games in one week. The last time a national champion was crowned at the Rose Bowl Stadium was on January 7, 2010. For more information please visit www.tournamentofroses.com. This entry was posted in 2013, BCS, Bowls by Travis Normand. Bookmark the permalink.